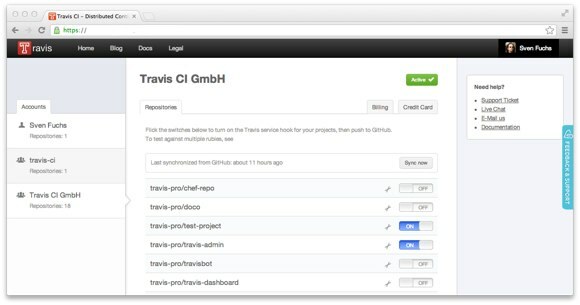 Today we are happy to announce that we have shipped the new Travis CI web client for Travis Pro. You can find a link to the new client on Travis Pro, we’ve sent a broadcast to everyone. Travis Pro is still in beta. If you are interested in trying it out but don’t have an account then drop us an email at support@travis-ci.com. We are going to follow the same practice that we’ve followed shipping the client for .org: We’ll make the new client available on a separate domain, in parallel to the old client. This way we can ensure there’s always a working, stable way to access Travis Pro, even if the new client should show any issues. We’ll keep things this way until we are sure everything is fine and then finally retire the old client. Please help us by giving feedback on any issues, breakage or weirdness. If you are eager to read an overview of all the features and goodies that the new UI includes you can find them in the original announcement. But the gist is: overall polished, much more responsive, fast and stable, new features like proper URLs, requeueing builds, flash messages etc.